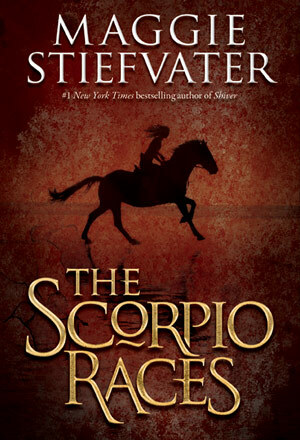 In The Scorpio Races, author Maggie Stiefvater creates an appealing story based on the mythology of the water horses. It is a fascinating tale in which the characters are simple yet complex, the story unique, and the setting as important as one of the characters. Kate, better known as Puck, lives with her two brothers on the small island of Thisby, “a rocky crag jutting from the sea”. They have lost their parents to the sea, and are in hard financial straits, which is why Puck decides to enter the competition of the Scorpio races, the first girl ever to do so. It happens on the first of November when the riders attempt to hold on to their water horses long enough to make it to the finish line. The race itself is not a long one but these water horses are dangerous because they eat flesh and are hungry to return to the sea as soon as their hooves touch the salt water on the beach. Sean Kendrick has won the races multiple times in the past and is known for having a way with the water horses. He understands them, and is particularly attached to Corr, a red water horse, in the same way Puck is attached to her mare Dove. Sean is a young man of few words, but he forms an unlikely friendship with Puck because of their love for horses. 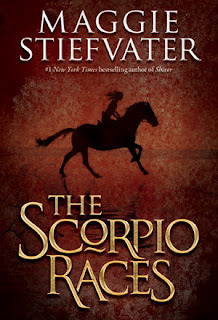 As their friendship grows to something more, and the date of the Scorpio Races--a traditional event in Thisby--draws closer, both have lots at stake, including their lives. I read this book with my twelve year old daughter who enjoyed it well enough with me. The story is told from the point-of-view of both Sean and Puck in alternating chapters, which my daughter and I liked. We both agreed that it was a long book and that its 400 pages could have been cut to 300 without losing its plot or intensity. The whole book prepares the reader for the races that happen within the last few pages of the book, so it felt like a very slow start. But we liked the quirky character of Puck. She was a strong female character with fears and sorrows and she was tough. Sean came across as wise and introspective, longing to be his own man and to own Corr. Stiefvater intersperses his serious mood with some humorous moments between the two of them and we relished these scenes. There weren't enough of them, though. Puck's younger brother Finn and George Holly, the American were also great secondary characters. The ending was great, and honestly, my daughter and I didn't know what to expect, so we held our breaths as the race began. We had waited so long for it to happen! This is a clean read, however, the water horses are wild and dangerous and there are some bloody scenes when they hunt or attack other animals and humans. My daughter who is sensitive by nature was not freaked out by these scenes probably because we also had the perspective of Sean who understood them and was angered when these wild creatures were not treated properly. This was a different read for us. It was fantasy, but so down to earth that we almost came to believe these water horses or capall uisce really did surface from the sea, hungry and sea-mad, galloping on the white shores of an island in search of its next prey or to be caught and trained for the famous Scorpio Races. Note: This book is rated V = violence for scenes of killing and blood, and it also contains a few crude words, no profanity.